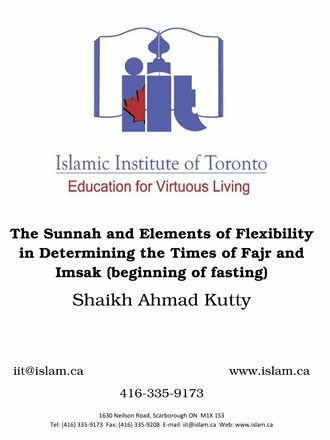 The Sunnah and Elements of Flexibility in Determining the Times of Fajr and Imsak (beginning of fasting) is a research paper prepared by Sheikh Ahmad Kutty, a senior lecturer and Islamic scholar at the Islamic Institute of Toronto, Ontario, Canada. The following essay is an attempt to clarify the issue of fajr al-sadiq (the true dawn) and the cut-off point for suhur (the pre-dawn meal), in light of the Qur’an, the authentic traditions, and the sound practices of the companions, their successors, and the venerable imams and scholars. The Spirit of Ease in Shari’ah Let me state from the outset that Shari’ah is all about ease and the removal of hardship for people in order to facilitate things for them. Shari’ah, as it has been articulated by eminent jurists, has the sole objective of catering to the welfare of people in both worlds. Consequently, practicality, balance, ease, and removal of hardship are all valid principles that have always been used as the criteria for providing rulings for people, according to changing times and circumstances. The Qur’an and the Prophetic Sunnah have reiterated this principle throughout. Allah says, “Allah intends to bring for you ease; and He does not wish to make things hard upon you.” (Qur’an: 2:185) and “He did not appoint for you any hardship in this religion: the way of your ancestor Ibrahim” (Qur’an: 22:78). Additionally, the Prophet (peace and blessings be upon him) is known to have said: “I have been sent to teach the simple, natural way (of Ibrahim).” (Cf. Ibn Hajar, Kashf As- Sitr, #37); “This religion is easy and simple to follow; whoever makes it hard will only be defeating himself.” (Reported by An-Nasa’i); “Make things easy for people; do not make things hard for them. Give them glad tidings, and don’t turn them away from religion (by making it hard on them)” (Reported by Al-Bukhari). A’ishah, the beloved wife of the Prophet (peace be upon him), tells us about the Prophet, when left to choose between two viable options, he would always choose the easier of the two, as long as it was not sinful; for if it had been sinful, he would be the farthest from it. (Reported by Al-Bukhari, Muslim and others).